Chamber Music at the Clark concert seating is determined via lottery. The booking-by-lottery entry form for Ying Quartet seats posts here on Thursday, March 16, 2017. Lottery registration closes Thursday, April 6, 2017. Melvin Kaplan Inc.), and the artists of the Ying Quartet. The Ying Quartet occupies a position of unique prominence in the classical music world, combining brilliantly communicative performances with a fearlessly imaginative view of chamber music in today’s world. Now in its second decade together, the group has established itself as an ensemble of the highest musical qualifications in its tours across the United States and abroad. Its performances regularly take place in many of the world’s most important concert halls, from Carnegie Hall to the Sydney Opera House. 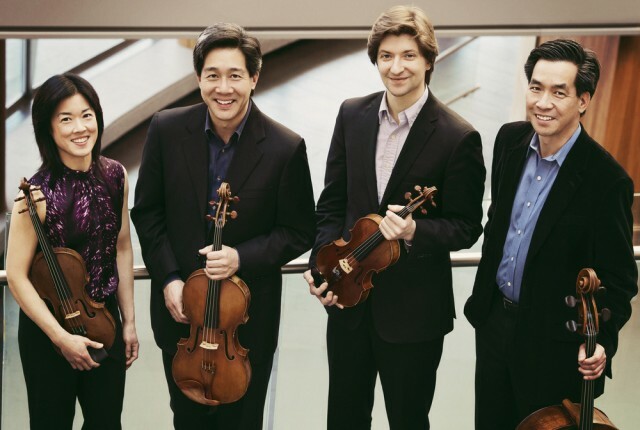 At the same time, the Ying Quartet’s belief that concert music can also be a meaningful part of everyday life has also drawn the foursome to perform in settings as diverse as the workplace, schools, juvenile prisons, and the White House. In fact, the ensemble’s constant quest to explore the creative possibilities of the string quartet has led it to an unusually diverse array of musical projects and interests. Melvin Kaplan, Founder, Melvin Kaplan Inc.
For more than fifty years oboist Melvin Kaplan has been one of America’s most influential forces in chamber music, both as a renowned performer and as manager, teacher, lecturer, and writer. As a soloist, he has premiered works by Vaughan Williams, Ezra Laderman, Hugh Aitken, Gunther Schuller, Mel Powell, Heitor Villa-Lobos, and Jean Francaix. On the faculty of the Juilliard School for thirty years, Mel was also for many years featured regularly as a lecturer/performer at the Metropolitan Museum of Art. He founded the New York Chamber Soloists, Festival Winds, and Vermont Mozart Festival. The Clark Library is grateful to Melvin Kaplan and his team for providing more than half the performers in its concert series over the last twenty-three years.